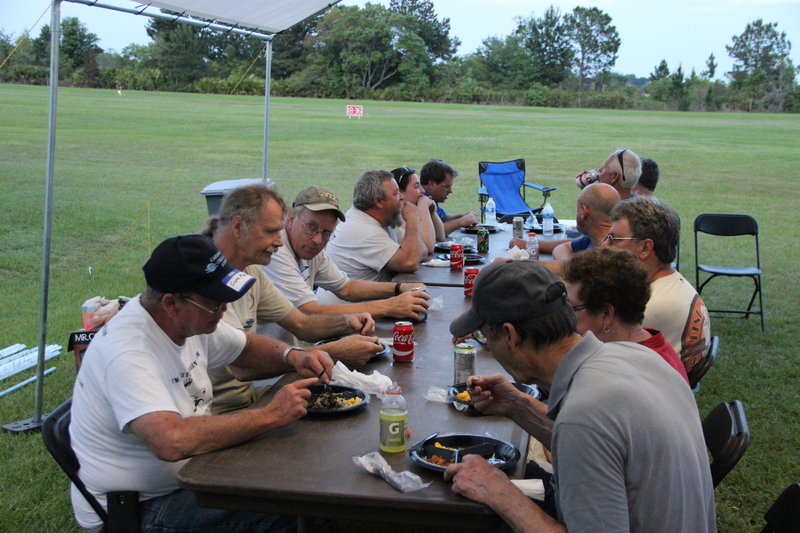 The major change in this year’s spring Florida College was the location: With just 19 days to go, we opted to change from the county airport we had planned on, to a privately owned, public use grass airport just 14 miles away. The shift turned out to be an excellent improvement, and made all the difference in the experience of Corvair College #33. Above, Bob Lester’s Pietenpol at CC #33, with the Ercoupe and a Luscombe in the background. Bob gave an intro flight to almost all of the Pietenpol builders on hand. The airport is our new spring College location, Mid Florida at Eustis. Our new location’s full name Is “Mid Florida at Eustis.” It is a privately owned, public use, grass airport, with beautifully kept grounds. It is in the 12 o’clock position on the extreme northern perimeter of the greater Orlando area. Its identifier is X55. It is an airport completely focused on flying for pleasure and sport. Because of its private ownership, it is an integrated part of the neighborhood where it is located; entering the airport grounds is like finding a welcome park, in contrast to the fencing, gates and barbed wire that most county airports have adopted in the past decade. Our Colleges are educational, friendly and social events. They fit in much better at a grass airport than one that could be mistaken for a maximum security prison. As nice as the location is, it is the ownership and management of Mid Florida at Eustis that sets the airport atmosphere, and makes it a standout. The field is owned by a gentleman universally known as “Rama.” In person he is very modest, but clearly of considerable personal success. He speaks of the airport, with its tree-lined green grounds, as an important peaceful refuge from a hectic world. I had a single 20-minute meeting with him to explain what a Corvair College was, and he was captivated by the idea, and immediately made his facility and staff available to us. It struck me as the way of traditional aviation; a meeting of ideas, a handshake, and on to progress. Rex Wyatt, the airport manager, took every effort to support our College. In an era where many counties find their airport manager by calling HR and asking for any bureaucrat with an MBA, Rex is a reminder of the time when the title “Airport Manager” was reserved for the most experienced aviator on the field, a friendly but firm man of character. He is also quietly modest, but in conversation it is revealed that he flew F-84Fs, helicopters out of Pleiku, and continues to this day flying corporate jets. 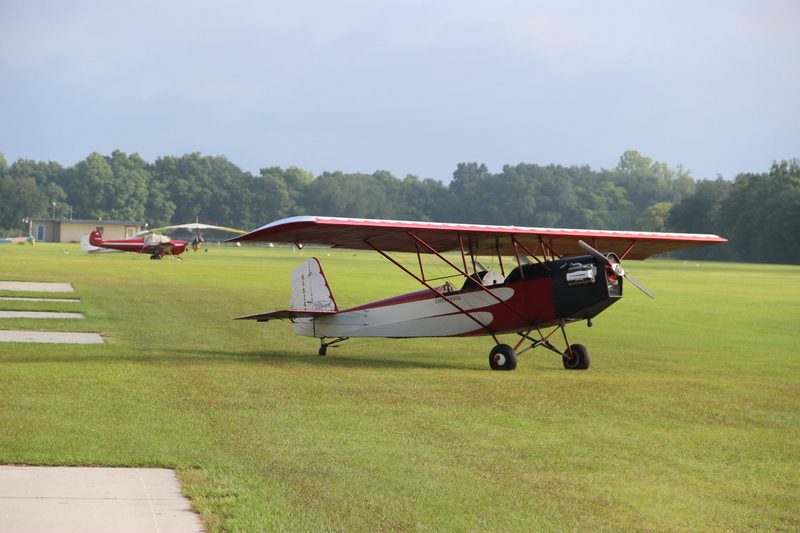 On the lighter side, he has an impressive GA background that includes being a longtime EAA member and having an enviable collection of classic American light aircraft. With some quiet pride, he shared that his grandson will shortly be attending Embry-Riddle. Having a manager with this depth of experience sets the tone for a friendly, but professional location. 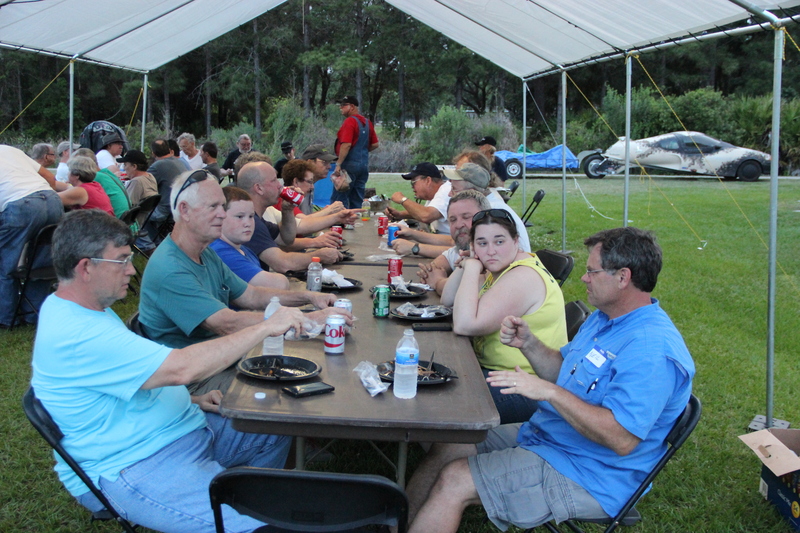 The airport provided spacious grassy camping areas shaded by live oak trees, next to a small lake. 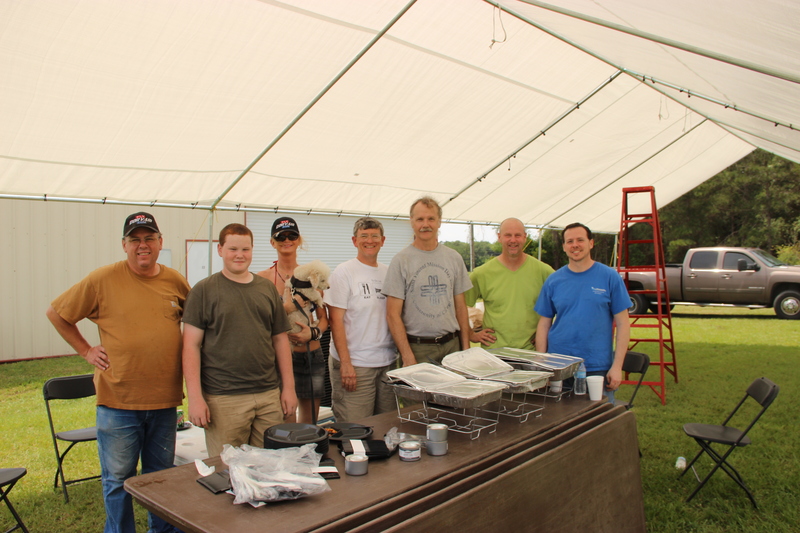 They set us up in a clean hangar, put up a large tent as a dining hall, and provided for every detail. The groundskeeper, Mr. Leroy, who lives adjacent to the airport, was available 24/7 throughout the event. He attended to the smallest point, such as finely mowing the camping area. When I tried to explain to him that Corvair builders were low key and didn’t require “the red carpet,” he smiled and simply said, “Rama said you were to be welcomed here,” and went back to his work. This welcome is part of Rama’s personal philosophy and has nothing to do with economics; the hangars are near full occupancy, they do not sell fuel, and there was little expectation that many of the College builders would be back before next year. I spent some time thinking about how these men were solely motivated by a basic pride in their airport and its good reputation, the factor that makes all the difference. 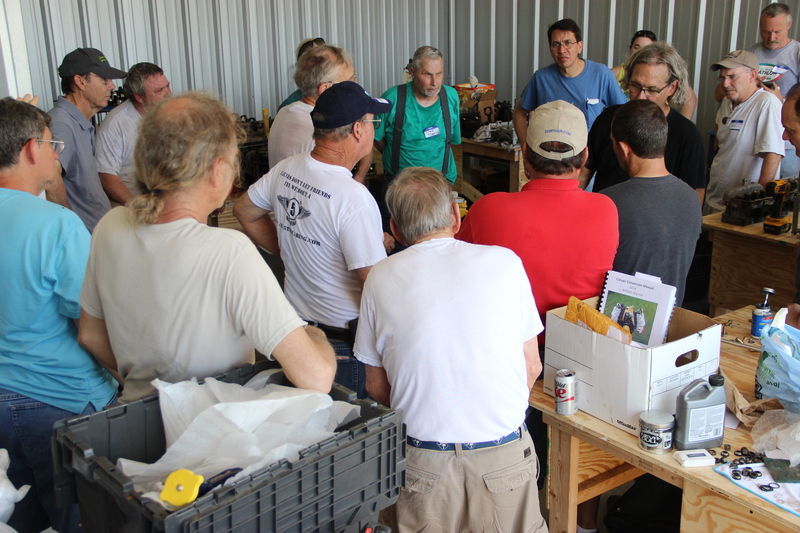 Above, first day of the College, builders gather around for a detailed inspection and discussion of rocker arms. Corvair Colleges are a mixture of small group discussions and individual progress. 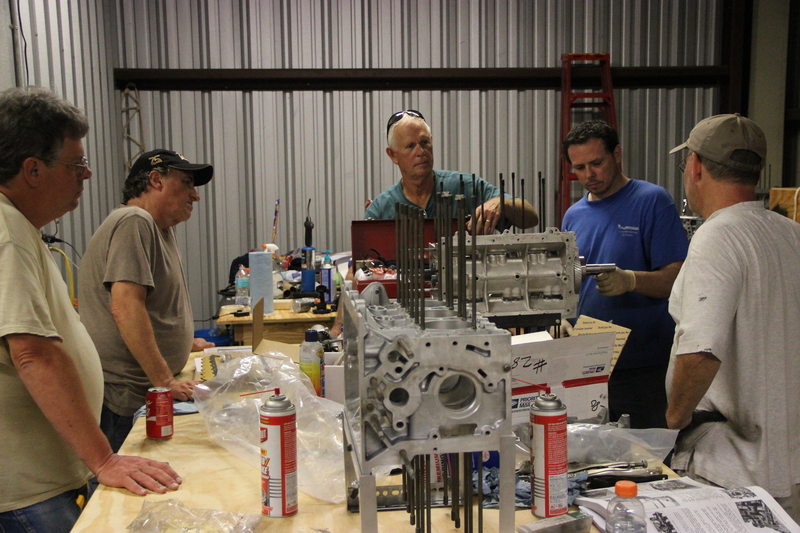 Some Colleges have many cores being taken down, others have lots of engine going to the test stand. #33 saw many of the former, a good indication that we always have many new people getting started in the Corvair movement. My sidekick, Vern Stevenson on the left, and 750 builder Lane Seidel on the right. Lane has been to a number of Colleges, and having worked in nuclear power operations for decades, he has a professional’s take on procedures and quality control that fits well with aviation. 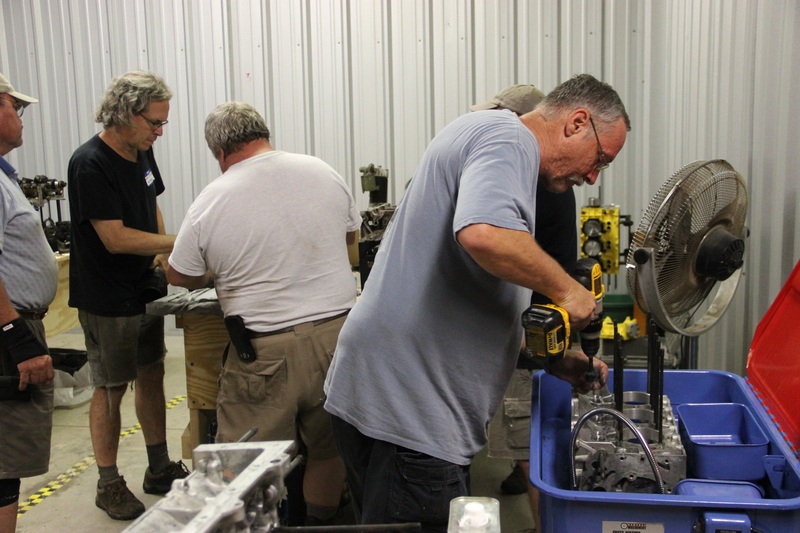 Above, a number of case assemblies were closed at the College, and I gave a demonstration on installing a Weseman 5th bearing on Saturday morning, which was replicated by a number of builders on their own engines. I keep a Weseman installation kit in my College tool box. It was supplied by Dan and Rachel to assist us in showing builders how to install their bearings at Colleges. Their builders who work at home can borrow an identical field kit from them. Even builders who just came to observe saw how simple the installation was. It was warm weather, and dining outside made more sense. 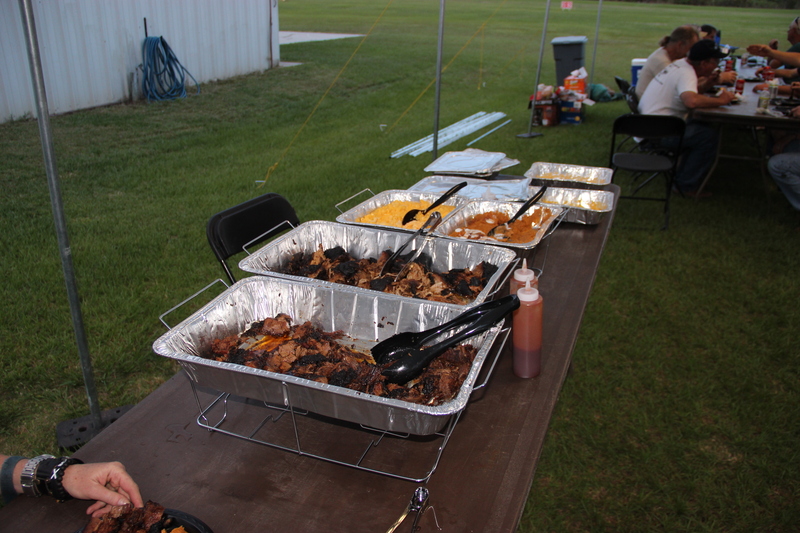 Everyone who signed up was fed catered food all weekend and all they could drink, all out of our modest fee. 100% of the collected money goes right back into the event directly. Central Florida has many well known BBQ houses, and Grace selected Black Bear Smokehouse to provide us with vats of pulled pork and brisket, and plenty of side dishes. Hot weather isn’t really conducive to gorging one’s self, but builders at the College did a great job anyway, loading up on seconds. All the breakfasts were catered by the local Bob Evans, because eating BBQ three meals a day isn’t considered a balanced diet in today’s nutritional guidelines. The smaller nature of #33 led to a lot of close attention between myself and builders. Even at big Colleges like Barnwell, I meet with every builder personally, but #33 afforded more individual time. The spiffy new wash tank is part of my program of buying 4 of many of the pieces of College equipment and leaving them on site for the following year. Before the College, Vern, Lynn Dingfelder and myself made eight new 4’x8′ tables that can be disassembled and packed for any College where we need to assure space for more builders. They are sturdy enough to have 4 engines built on them at the same time. 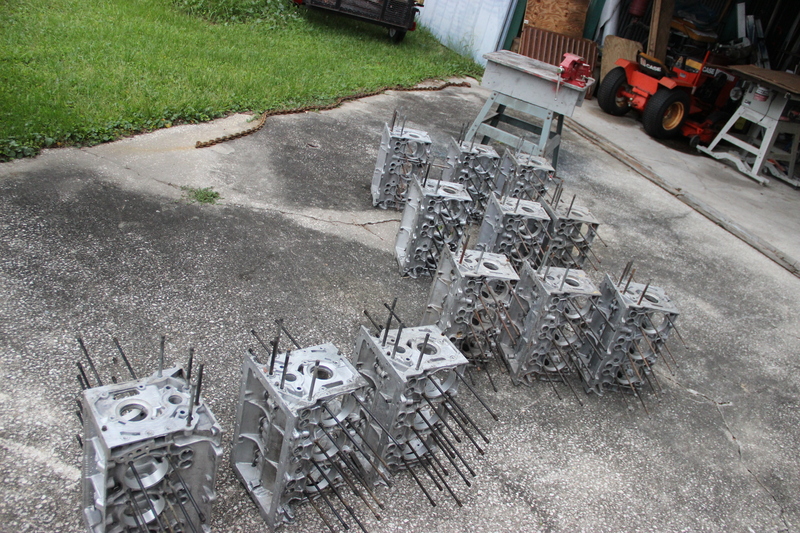 Pictured above are 12 cases, already chemically cleaned and machined to accept 3,000 cc cylinders. A number of builders sent their case in advance, and we processed it and they picked it up and started assembling it at the College. The price of this is included in the 3,000 cc kits we sell, but we are glad to break it out as a separate $300 charge, to allow builders to budget closing the case, and pay the balance of the piston, cylinder and rod kit later. 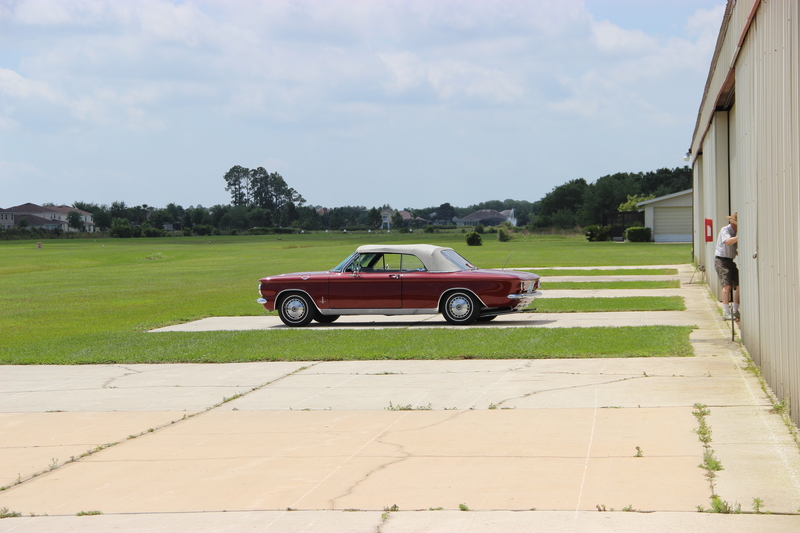 Out of the blue, the early Corvair convertible above showed up 3 hangars down – the owner had no idea that there were 36 other Corvair engines 200 feet away. 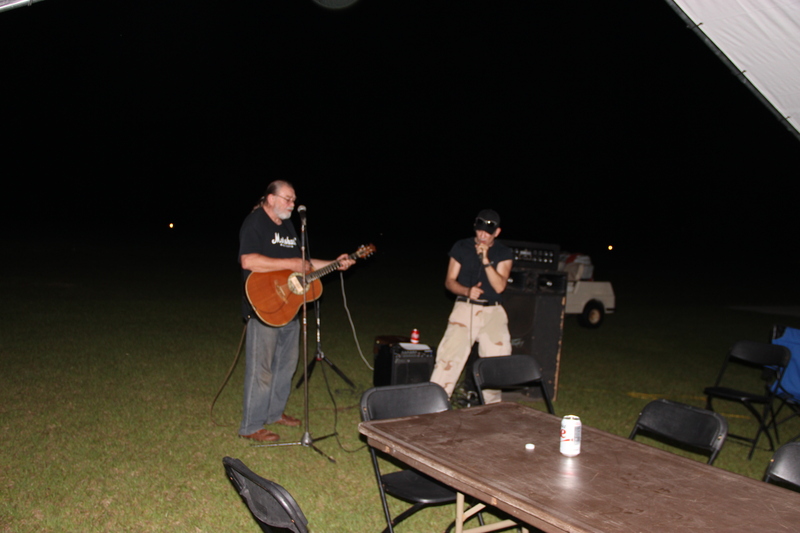 Above, on Saturday night after dinner, we had an “unplugged” gig from our friend Ron Thomas and his friend Ren. (The full band goes by the name “Afterburner.”) They covered a number of tunes from the 1970s, including a powerful version of the song “Sandman” by the band America. Ron, who is singing above, is a native of New Orleans, and has made a living in music all his life. Ron has met a number of Corvair builders at our Oshkosh booth over the past two years. He is a pilot, an Ercoupe owner and fan, just getting to know experimentals. At Oshkosh 2013, he met Pat and Mary Hoyt when they flew in with their yellow and polished 601XL. At Oshkosh 2014, Ron got out of his truck after driving 1,300 miles solo, walked past a yellow and polished RV-12 being filmed, mistook it for Pat and Mary’s plane, and promptly said to the guy in front of the camera, “Dude, Pat and Mary, what great people! These Corvair/Zeniths rock!” Ron said the guy being filmed had some kind of childish negative reaction. I later walked down to the Van’s aircraft booth with Ron, and when he pointed the guy out, I thought it was funny because it was Richard VanGrunsven. Above, Fisher celebrity builder Skip Beattie, Grace and myself in front of the hangar. Vern’s “Aerotrike” nose on the left in the picture. 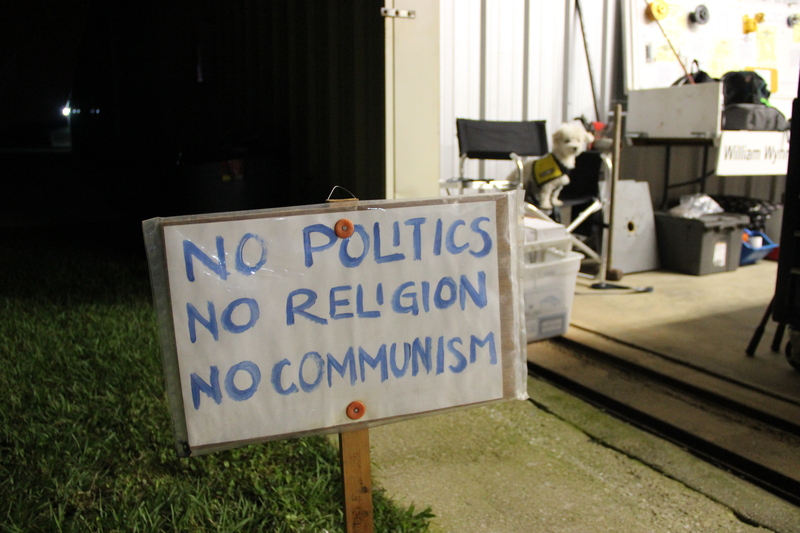 Above, late night Scoob E sits in his chair while the three rules sign is displayed. Grace painted this several years ago, and it has been to all colleges since. The top is self explanatory: Politics is not an allowable topic of conversation. The second isn’t in the same context that John Lenon used it in the song Imagine, We use it in the sense that I consider faith a private matter, and the diversity of builders at the Colleges means that it is merely good manners to be quietly respectful of others. Anyone who has attended any of the 5 Colleges in Barnwell knows that P.F. Beck and crew start the dinner with a prayer to give thanks and a moment of silence to remember those past. The two words on the sign are to remind a small number of people the popular understanding of the term “Pious” implied a faith that was evident in deeds, and not spoken of. The third line is a reference to the notion that you can’t build a good American engine with torque wrenches made in a police state like the People’s Republic of China. Above, dinner time in the chow tent. Vern Stevenson is standing in the red shirt, his Aerotrike, half Lancair 320 and half Geo Metro, is in the background. It has 18,000 miles on it now. Under Florida’s open minded Motor Vehicle code, it is considered a motorcycle. Behind it is its custom tiny 4×8′ 5th wheel trailer Vern built for it. 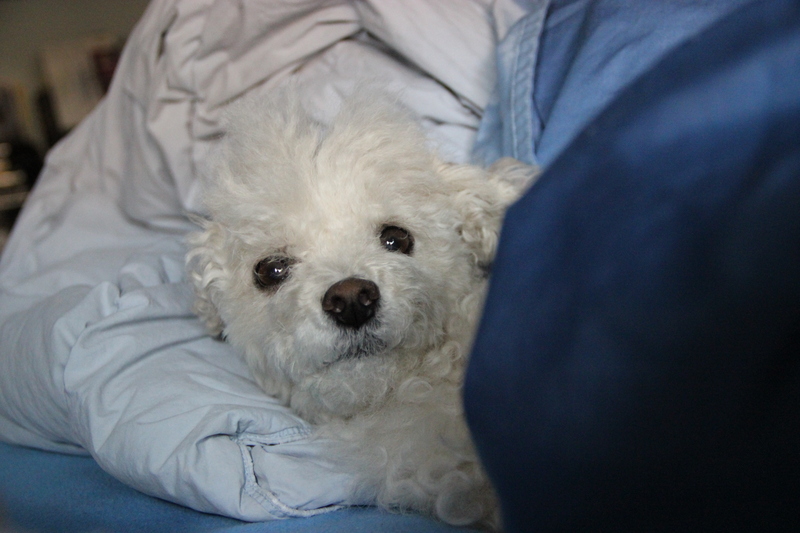 Above, gratuitous dog photo. Scoob E was very happy to be at the College, but 7am on Sunday, he makes the “get started without me” face. The Last Man Standing Photo: From left above are Lane Seidel, Jack Reynolds, Grace and Scoob E, Richard Tomanio, Lynn Dingfelder, Bill Reynolds and Robert Audsley. Colleges have a tradition of a handful of builders staying late to get in the last wrenching and assist with the pack up. This crew was great assistance. If it looks like it was fun and productive, that is because it was. We are looking forward to another College in Eustis next year. Don’t miss it. -ww. William, WOW is all I can say! I am 54 and you have inspired me to consider building a Pietenpol. It will be obviously my last great endeavor but in the path of the likes of Bernard I would be proud to continue the legacy. Hey and by the way, I lived in Sorrento for 3 years in the late 80’s . Great bar called The Oasis was my hang-out! William, Grace and all your crew. Thanks for making it a great event. Looking forward to my next CC………………….be it Mexico or Barnwell. CC#34, which has the sign up open now, will be at the Zenith factory in Mexico MO, in September. Given that you are building a 750, it would be a good event to attend. #35 will be back in Barnwell SC in November, and it will be geographically the closest even to you this year. We will open the sign up for it just before Oshkosh.